Recently, I was passed this super tiny thumbsize speaker from X-Mini to be reviewed. This came at a rather perfect timing since I was actually looking out for a good, mini speakers which can actually play out better quality music from my iPhone. The one I'm going to do a short review of today would be the X-Mini ME Thumbsize Speaker. Through the different generations of X-mini™ Capsule Speakers™, the focus has always been on delivering good quality sound. The philosophy of Sound Beyond Size has been revisited with the aim of changing perspectives on the sound to size ratio. 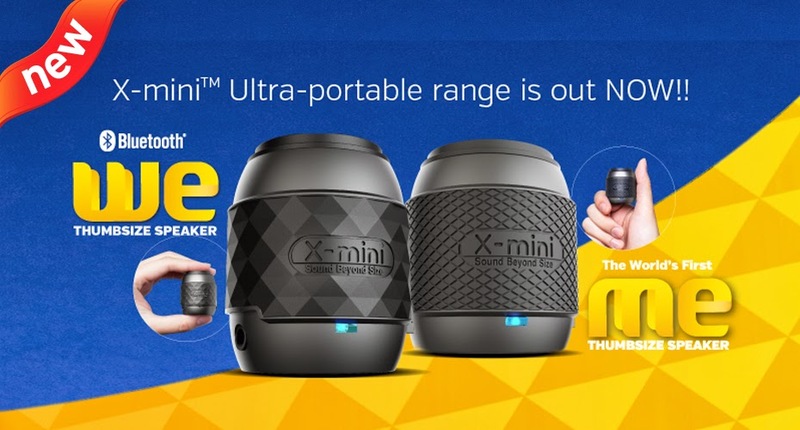 With the new form and size of the X-mini™ ME, Xmi Pte Ltd is excited to consolidate its leading position in the portable speaker category by redefining the standard in portability once again. Upon unboxing the X-Mini Me Thumbsize Speaker, I was really impressed with the miniscule size of the speaker. I could actually pinch it between my fingers, holding it like a piece of 'kuih'. It got me thinking on how the actual sound would be like. I mean, how good can it be if the size is this small? Boy, was I wrong. Read on for my take on this speaker. It was a relatively simple affair of plugging in the speakers into the headphone jack of my iPhone, a quick flick of the ON button on the X-Mini Me Speaker, and voila! Beautiful, sweet music with a surprising boomy feel came out from the speakers. Boy was I surprised, how could a gadget as small as this produce such a nice sound comparable to other speakers triple its size. My guess is the magnetically shielded 31mm speaker has been made to perfection for our ear's pleasure. Now I did try to take a video to show how the speakers function, and have even linked it below. Unfortunately, Youtube decided to mute the sound because of the song played via my radio channel was copyrighted. Pretty sad. Loop a lanyard or keychain around the metal bar and bring it everywhere you go. Up to 6 hours of playback with easy Micro-USB charging. Best used with smartphones, tablets and portable game players. Simply plug and play your favourite tunes! Do check them out at their official website at http://store.x-mini.com to find out more about this awesome gadget. The one I have, the X-Mini ME Thumbsize Speaker currently retails at SGD 29.90, which is a pretty good price for what it offers if you asked me. Now don't mind me, while I continue to enjoy the sweet music playing out from my smart devices. awww really too bad cant hear the sound to this tiny little thing. Oh .. I got a x mini too and it's really powerful ! In this occasion, however, leaving the security exchanged in will have just a little effect to the sound, so for what reason not abandon it on?